MYRTLE BEACH, S.C. (September 6, 2018) - Myrtle Beach Pelicans right-hander Cory Abbott has been named the Chicago Cubs' Minor League Pitcher of the Month for August, the organization announced Thursday. A native of San Diego, Abbott went 2-0 with a 0.67 ERA in five August starts. Over 27.0 innings, Abbott struck out 29 against 10 walks while holding opponents to a .188 average (18-for-96). 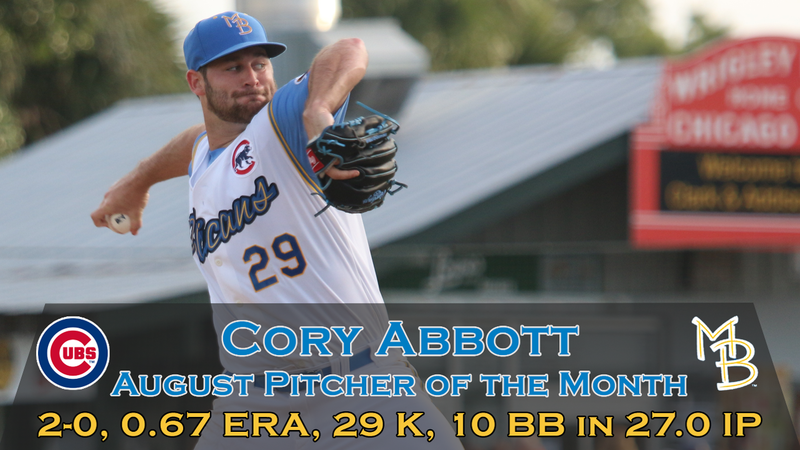 Abbott's 0.67 ERA was the best for any Cubs pitcher during the month and also placed at the top of the Carolina League. He closed the season on a 19.0-inning scoreless streak by firing three straight shutout outings to complete the campaign. The Cubs' second-round pick in 2017 out of Loyola Marymount University (Calif.), Abbott made 22 starts between Low-A South Bend and Myrtle Beach in his first full professional season. The right-hander yielded just 94 hits and struck out 131 against 39 walks in 115.0 innings. Abbott follows fellow righties Matt Swarmer (April) and Erick Leal (July) in earning Cubs Minor League Pitcher of the Month honors. Catcher Jhonny Pereda (May) and infielder Jared Young (July) earned the organization's Player of the Month awards in 2018 with Myrtle Beach.